Eligible associates impacted by these store closures will receive severance and will have the opportunity to apply for open positions at area Kmart or Sears stores. Customers can use the store locator function on our web sites to find the location of their nearest Kmart and Sears stores. Liquidation sales will begin as early as January 12 at these closing stores. How about the fact that in 2018, companies are still using the euphemism "right size"? I'm beginning to suspect that the members' preferences for Sears' physical store footprint is around zero. Back in 2016, I visited one of the stores whose closure was just announced. 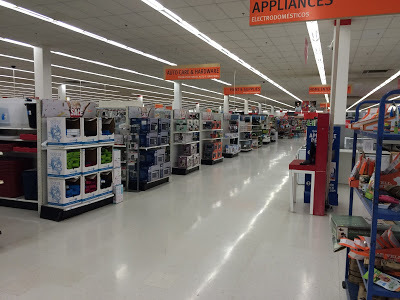 While taking care to note that my observations were clearly anecdotal and not necessarily reflective of the entire Kmart chain, I did share some observations (and some pictures). I approached the Kmart on East Fourth Street in Ontario a little after noon. The employees were nice enough, and the problems that one employee was having with a store computer may not necessarily mean anything. But after a few minutes of walking around this particular store, something struck me. If I were to walk into a Costco or a Walmart on Sunday at noon, I would usually be fighting mobs of people. And while there were people in some sections of the Kmart, other sections were oddly empty and quiet. I was told later that traffic usually picked up in the afternoon, but it still seemed strange to be in a major store on a weekend afternoon and to see empty aisles in some places.